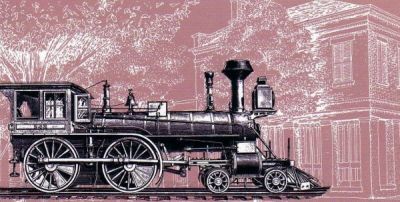 The completion of the Marion to Cahawba railroad 1858 should have been a water shed event in Cahawba’s development as a town. Ironically enough, it was the apex. The fall was to come shortly after when the Confederate army tore up the entire railroad to use the track to finish the Selma-Demopolis line. Almost as soon as Cahawba was connected to the new river of commerce, the rails, that connection was terminated. All that remains of the railroad today are a few spikes, a stretch of iron rail, and an earthen railroad embankment. 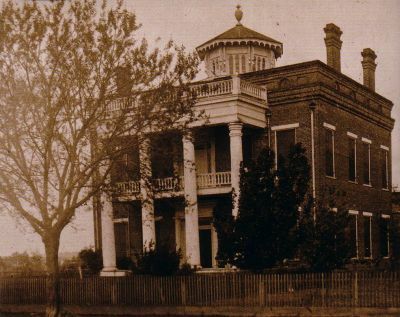 After the loss of the capital in 1825, Cahawba still remained the seat of Dallas County and by the 1850s, would rise again, buoyed by speculation over the imminent construction of the Marion to Cahawba railroad, that promised to reestablish the former capital as a center of commerce. During these years, the spelling of Cahawba changed to the modem spelling “Cahaba” for both the town and the river. As a large influx of immigrants and settlers entered the area during the boom days, the name change may have been a conscious act to reflect the new vitality of the cotton town. The grand Saltmarsh Hall rose as a site for balls and parties, a female academy was established, as were many grand homes that stagger the imagination such as the Perine, Kirkpatrick, and Crocheron residences. Records show that by income, Dallas County was the wealthiest in the state and ranked among the top five counties nationwide. Cahawba again seemed headed for greatness and was one of the state’s most cosmopolitan cities with an estimated population of 3,000 to 6,000. Then came the Civil War, effectively crushing any hope of it becoming the great inland town of Alabama, much less the New York of the South as many had hoped. When the county seat of Dallas County moved from Cahawba to Selma in 1866, the former capital’s population dwindled. With the removal of the county seat, families followed. Shops closed and houses emptied. Freedmen now used the old Dallas County Courthouse building for political meetings. Cahawba became known as the “Mecca of the Radical Republican Party” as the former slaves struggled to gain political strength. In fact, the freedmen, using the partially ruined old state house for meetings, shared more than one similarity with their surroundings: like the now-insubstantial ex-capital, these freed slaves sought recognition. This ghost town marked a fitting symbol for their plight, since the freedmen remained in that strange sort of political and physical limbo of being considered more than a slave and yet still less than a man. By 1870, the town’s population had fallen to less than 500, the majority being freedmen from nearby plantations. Soon, even they abandoned the town. By the turn of the century, Cahawba’s buildings were in ruin. 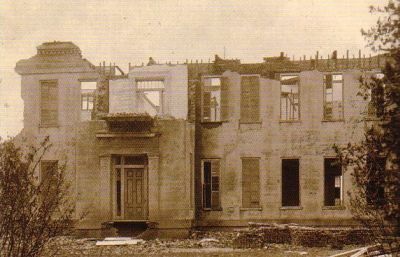 Most of the photographic records we have date from this period when dismantled structures were sold for scrap or had already begun their slow collapse into obscurity: columns of the female academy standing before the brick-laden ruin of the building, the magnificent two-story brick shops of Vine Street crumbling into decay, corn growing in a small plot near the old Crocheron mansion’s remains where Confederate General Nathan Bedford Forest met with General Wilson to discuss an exchange of prisoners captured during the Battle of Selma. Comparing Cahawba during its zenith to that of its final collapse can be disquieting. Few American cities reach such heights and then disappear altogether, leaving scarcely a sign of their passing but old pictures and words in history books, journals and the accumulated memories of the town’s descendants. By the 1930s, few buildings remained. Fishermen and hunters moved into what once was an urban setting now covered in woods and undergrowth. Alabama’s first permanent capital was a fishing camp. Roads leading through a capital city had become paths in a wilderness once again. As a historic site, the area today presents a marked contrast to the position Cahawba once held in Alabama history. It was a city raised with an eye to the potential, a city full of promise. Land was cleared in the wilderness, lots drawn up and sold. People flocked to the newly-declared capital, knowing or hoping against hope that after goods flowed down the Cahaba and then Alabama rivers to Mobile, money would come back up. Unincorporated in 1989, in the quiet, dusty streets of Old Cahawba, you can still follow Arch Street as it passes into Vine Street and watch the Cahaba River’s waters join with those of the Alabama’s. Where once stood a vibrant, bustling town of more than 3,000, today it is an eerie landscape of empty streets stretching forth amid trees and meadows. Nearly all the grand estates, shops and buildings that were Cahawba have been dismantled, moved or sold for scrap, but you can see the artesian wells, some still supplying water for a populace long vanished. Collapsed cellars remain, as do the brick columns of the old Crocheron place. The people are gone, but just as William Wyatt Bibb saw in the landscape a vision of what Alabama could become, today’s visitors to this serene landmark can catch a glimpse of how the state of Alabama began. And what Cahawba could have been.